【Apply to multiple systems】Support For IOS&Android System,IOS7 Or Above Such As 4S/5/5S/5C/6/6S/7/7Plus/Ipad3/4/Mini/Air/Mini2/Ipod Touch 5,Android 4.3 Or Above Such As Samsung S3/S4/S5/S5Mini/Note2/Note3/Note4/850,Xiao Mi 2S/3/4,HuaWei B199/8816/Honor3C/6/Mate7/P7,Sony Xperia Z2/Z3,HTC Desire816/ONE,Oppo Find7/R7007,LG Nexus5/G3/G4/Nexus6. 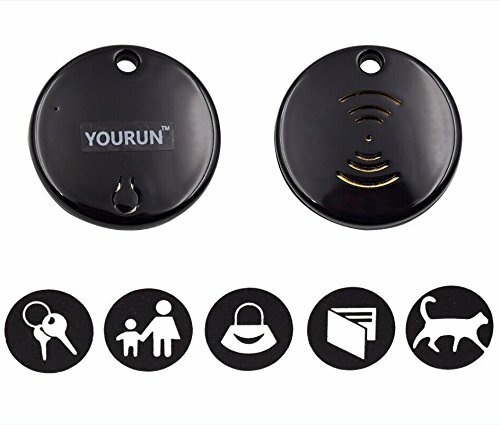 【Anti-Loss Alarm And Reminding Function】Calling The Important Items Through APP,Items That Are Held Together With The Device Will Remind You By Voice,And You Will Say Goodbye To The Trouble Of Finding Things. 【Two - Way Reminder】Refuse To Lose.When The Device And Mobile Phones Exceeds The Safe Distance, The Mobile Phone And Device Will Alarm Simultaneously.Mobile Phones And Important Items Both Can Prevent Forgetting,And Let Loss Is Not Happening. 【Location Record】It Can Record The Last Location Of The Items Tied To It And Reduce The Area Search.It Can Trace Your Car Location On Parking Lot. 【Professional Customer Service】We Have A Professional Customer Service Team,If You Have Any Questions,Please Send Email To Us,We Will Provide Assistance Asap. More Guarantee For You:Replacement Or Refund Warranty. If you have any questions about this product by YOURUN, contact us by completing and submitting the form below. If you are looking for a specif part number, please include it with your message.